Browse our amazing product lines! We know that quality and precision matter when tackling more delicate projects in wood, plastic, light metal and wallboard. Our coping saw blades are made in the US of high quality materials like hardened and tempered spring or high carbon steel with precision punched or milled teeth for accurate sawing, smooth finishes and long life. 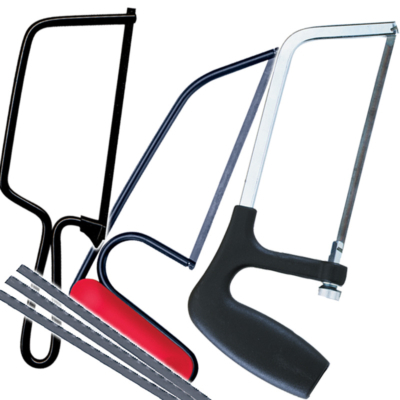 They have the right strength and flexibility for cutting external or interior cutouts in woodworking and carpentry when using our coping saw or any other coping saw. The quality of our coping saws and blades doesn't mean they come with a high price tag. The Zona flat wire frame for tensioning standard pin end coping saw blades is 12" overall length with 6-1/4" depth of cut. Blades can be turned 360º to saw in any direction. A good jewelers saw is used to cut very thin, soft metal sheets and rods or wire. 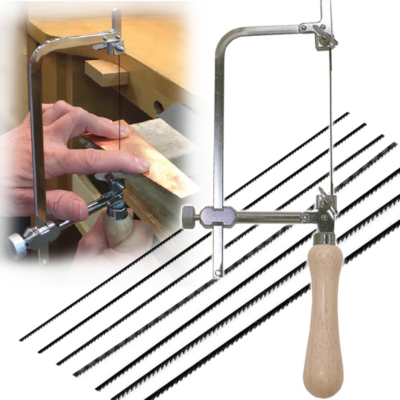 Zona's jewelers saws have wooden handles attached to a D-shaped frame with a saw blade strung between the tips of the frame forming the D. When choosing a saw consider the depth it will need to cut out shapes. Here we have 2-7/8", 3" and 5" depths. The frame adjusts for a shorter length blade – so if you break a blade – the frame can be made shorter to continue using that same blade plus, a shorter blade span may make the blade less likely to break. To secure the blade in the saw, slide the flat end of the saw blade in between the frame and the flat pieces of metal at either ends and tighten the finger screws until the blade is secured and can’t slip out. The tension on the blade is achieved by pushing the ends of the frame together, tightening down the finger screw on the other end of the blade and then release the tension, making sure the blade is not slipping at either end. If the blade starts flexing backwards toward the bow of the saw it may need tightening, or you may be pushing too hard. To use a jewelers saw for piercing, drill a tiny hole in the center of a cutout, loosen the top blade screw on the saw, thread the work item onto the saw blade, tension the saw and tighten the blade again and then cut out the shape. A jewelers saw is fairly simple, but it takes practice to master. The blades are very delicate and fragile, but they can cut materials as no other blade can. Be sure to have a good supply and assortment of blades for your projects. Zona offers high quality German-made jewelers saw blades. Zona also has unique, American-made sanding and filing accessories: Scroll Saw Files which are steel coated with silicon carbide abrasive and Scroll Sanders sandpaper strips, both can be used in a jewelers saw and can sand and smooth wood, plastic, metal, and composites. Junior or Mini Hacksaws easily fit in your toolbox or in limited spaces and are great for making fast cuts in small pieces of metal, wood and plastic – such as a metal rod, a block of wood or PVC tubing. Zona offers a choice of Mini or Jr. Hack Saws from one with a basic steel frame to a saw with ergonomic handle and blade tensioning screw. Our Mini or Jr. Hack Saw Blades are made in USA. The fine tooth blades cut metal and plastic. The coarser tooth blades cut hard and soft wood. We take pride in our selection. So if you're looking for a replacement mini or junior hacksaw blade or just a smaller backup to keep in your toolbox, you’ll find all of that and more at Zona Tools. 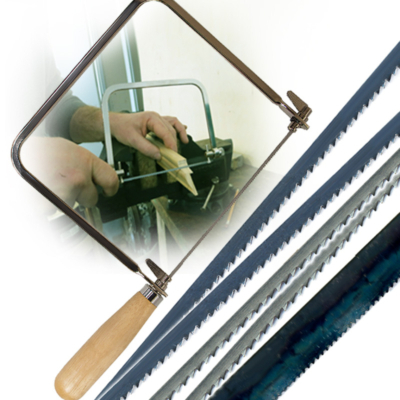 For sawing small and thin pieces of wood, soft metal and thin plastic a miter box and hand saw is often a faster and safer choice than any sort of power saw. Zona's miter boxes are very accurate for cutting square ends, perfect splices or mitered corners, in detail work such as moldings, beadings, tubing, dowels and miniature building projects. 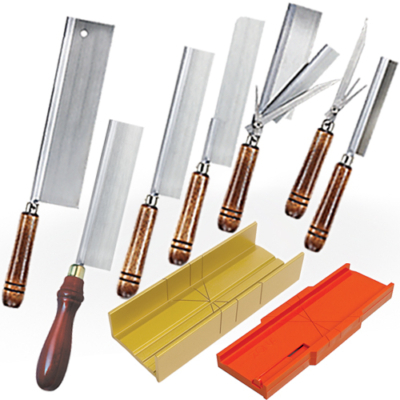 The thin slot aluminum and the plastic mini miter box are made in USA and are designed for super accurate 30º, 45º and 90º cuts with very thin blades such as those on Zona Razor Saws, and we offer sets with these combinations. The wide slot aluminum miter box is imported and can be used with razor saws or thicker blades such as those on a mini hack saw. 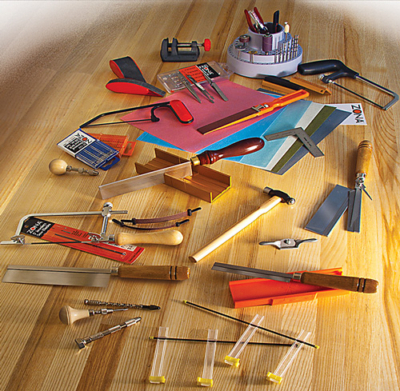 Zona's Razor Saw line for woodworkers, modeler builders, luthiers, craftspeople, and do-it-yourselfers have polished wooden handles, steel backs and sharp blades for making straight, accurate cuts with smooth edges in wood, plastic, balsa, Styrofoam and soft metal. Our Razor Saws are 100% made in the USA in our Connecticut factory. They are very reasonably priced and are among the most recommended razor saws you can buy – anywhere. We carry 14 different of Razor Saws and sets for a range of cutting from super fine to dovetail cuts to give you the chance to tackle projects however you see fit. For instance our Saber Saw Set has 3 removable blades, each with numerous applications. And our Ultra Thin Kerf Razor has a .008in kerf which is the thinnest we have available. All of our razor saws are specifically crafted to exceed your expectations and thrive on a wide range of different projects. No matter your hobby or profession, one (or more) of our razor saws would make a worthy addition to your toolbox. This category is for retail store owners participating in the 'ZONA direct' Program. If your customers are looking for a variety of tools, The Spinner Rack is an ideal choice since it's a complete Tool Center in a tiny footprint. The Planograms make it easy to select, organize and display our most popular products. Zona tools have great appeal among to a broad array of people who are busy building, customizing, modifying, learning, creating and designing. Who uses Zona tools? Hobbyists, model ship builders, scale aircraft modelers, model railroad builders, guitar builders, crafters, furniture makers, model car enthusiasts, home improvers, students, educators, do it yourselfers (DIY), dollhouse & other miniaturists, scratch builders, sculptors, luthiers, architects, engineers, makers, independent inventors, designers, tinkerers, and artisans.. There are times when a fine set of drill bits are very handy, and when it comes to fine bits, they don't get much finer than these sets from Zona Tool. Whether you are model making, making jewelry, working with wood, metal, plastic, glass, ceramic, even stone, these miniature twist drill bits can drill incredibly tiny holes. How fine? How about 0.3mm to 1mm in 0.05mm steps (then from 1 to 1.5mm in 0.1mm steps)? 0.3mm, or 300µm. All are competitively priced. They are available in metric and imperial, and as diamond coated bits, which is why glass, stone, ceramic can also be drilled with precision. Of course you won't be mounting these bits in a standard power drill. There are bit holders or drivers, Hand Drills and Pin Vises from Zona as well. One is double ended for larger and smaller bits, the other is a twist-drive, which can hold the finest bits. Other choices include wooden handled tool holders and steel pin vises which can also be used in stationary drill press chucks. 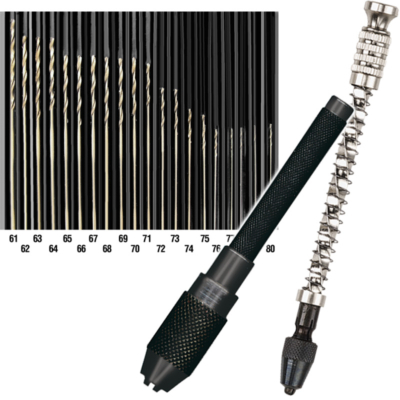 Some Zona hand drills can hold bits and accessories with shanks as large as 3/32" or 2.35 mm, plus, burs reamers, taps needles, gravers and needles. 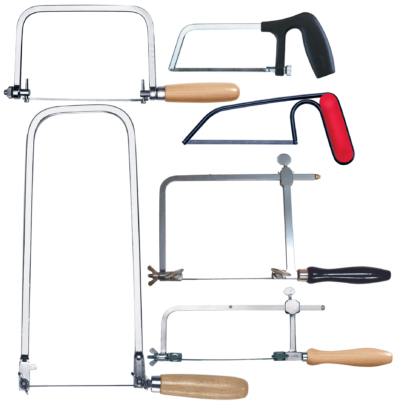 Zona's Razor Saw line for woodworkers, modeler builders, luthiers, craftspeople, and do-it-yourselfers have polished wooden handles, steel backs, and sharp blades for making straight, accurate cuts with smooth edges in wood, plastic, and metal. Our Razor Saws are 100% made in the USA in our Connecticut factory. They are reasonably priced and among the most recommended razor saws you can buy - anywhere. 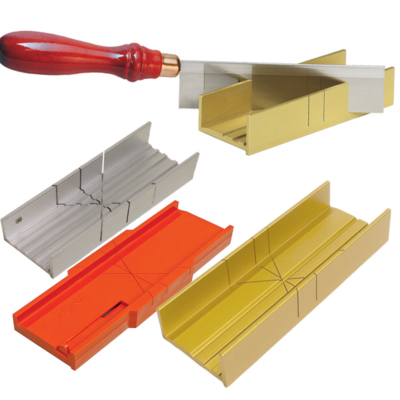 Zona's miter boxes come in metal and plastic and work with various sized razor saws for cutting square ends, perfect splices and mitered corners. Our two thin slot miter boxes – 35-250 and 37-240 are also made in the USA. Our full lines of coping saw blades, mini hack saw blades and jewelers saw blades, plus saw frames & tools to sand and shape. Zona offers many small hand tools and retractable hobby knives used by hobbyists, model builders, artisans, craftspeople, furniture makers, and do-it-yourselfers. View or download the Zona Tool Catalog (620KB). 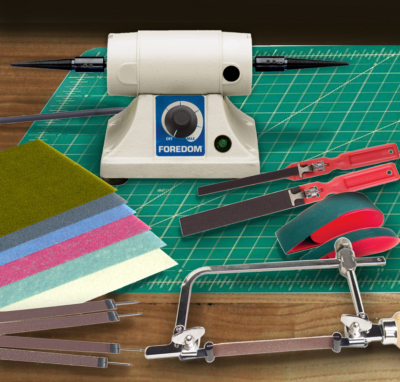 We now offer a Foredom® Bench Lathe + Zona® tools, to grind, sand and shape.